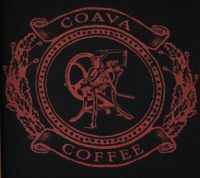 Coava Coffee Roasters, on Hawthorne Boulevard, is another of Portland’s many coffee shop/roaster mini-chains. Coava’s a chain of two, with the roastery (combined with another coffee shop) being about 20 blocks away in the direction of the city centre. This branch is another shared space, in this case, the lobby of Hawthorne Twenty Six, a modern residential building on Hawthorne Boulevard, between 26th and 27th Avenues. It’s a beautiful space, split across two levels, with high ceilings and generous, south-facing windows. Coava specialises in roasting single-origins (no blends here!) and forging strong links with individual farmers. Pictures of some of the coffee farms that Coava works with adorn the walls at Hawthorne. Typically, Coava roasts up to eight single-origins at any given time. Of these, two are available as espresso (along with decaf), while a third is on bulk-brew. If you don’t like what’s on offer, just wait a day or two and it will change, although this is quite pedestrian compared to the main shop/roastery, where the coffee can change several times a day! Talking to the baristas about this, they admitted it could be quite stressful trying to constantly dial new coffee in when it was busy! You can read more of my thoughts after the gallery. Coava Coffee Roasters occupies a beautiful spot on Hawthorne Boulevard, a busy four-lane thoroughfare running due east from the centre of Portland. Sharing the space with the lobby of Hawthorne Twenty Six, Coava has its own entrance from the street, which leads into a small, rectangular space with the counter to the right. The only seating up here is an L-shaped bar with enough space for three people, overlooking the main body of Coava which is off to the left. This has the majority of the seating and is accessible down a couple of steps (although there’s a ramp providing step-free access down the back of the space, running behind the bar). It doubles as a lounge for the residents of Hawthorne Twenty Six and, outside of opening hours, steel shutters separate it from the upper area (where the coffee and counter are). When Coava’s open, more meshed-steel shutters separate the lounge from the lobby, but the residents still have access through a fearsome-looking steel door in the far corner (the residents have a key). At first sight it seemed overkill, but it actually makes a lot of sense. It must be nice to have such a great coffee shop in your apartment building’s lobby. The lounge is spacious, with wonderfully-high ceilings and plenty of south-facing windows. There’s a concrete floor, with white walls and ceiling, and although it sounds rather stark, the reality’s much warmer and welcoming. Everything’s arranged around a large, eight-person communal table, running lengthwise in the centre of the room. Behind that, between the door to the lobby and the bottom of the ramp, is a long, nine-seat bar which looks (through the meshed-steel shutters) into the lobby itself. On the other side, a six-person bar straddles one of the windows, while the other is occupied by a generous corner sofa with a massive coffee table. Finally, on the left-hand wall next to the lobby door, is an enclosed fire; cosy, I’m sure, in the winter, but rather superfluous on the summer’s day I was there! Finally, there’s the option of sitting outside on the busy (and steeply-sloping) road, a pair of tables flanking the double-doors. Back inside, the counter occupies the entire right-hand wall. A simple, steel-framed, wooden affair with stone top, it’s an interesting shape, slowly narrowing as it progresses to the left. The three grinders are tucked away to the right, then comes the La Marzocco espresso machine, followed by the serving area, built-in cake counter and, finally, till. There’s also a set of retail shelves, immediately to the left of the door. The coffee menu is commendably concise, as is the selection of cakes/pastries. During my visit, I had a choice of Ethiopian (which was also on bulk-brew) or Guatemalan. Normally I’d have tried the Ethiopian both ways, but I’d already had a similar one the day before at Case Study, so I tried the Guatemala. This was quite dark and bitter, not at all what I was expecting. Fans of lighter, more delicate roasts may well be disappointed, although I quite liked it. It reminded me of a (good) Italian espresso blend. Initially, I was surprised: why roast a single-origin that tastes like a blend? On the other hand, why blend if you can roast a single-origin to taste like one? Don’t forget that you can share this post with your friends using the buttons below. This entry was posted in Apartment Blocks, Cafe/Roaster, Cake, Coffee Shops, Laptop Friendly, Portland (Oregon), Retailers and tagged Coava, include, PortlandPortland2015 by Brian Williams. Bookmark the permalink.